What is the Internet of Things? Unknown to many, 'Memento' and 'Iron Man 3' star Guy Pearce has been writing music since he was cast in the Australian soap opera 'Neighbours' back in the 1980s. However after 'Neighbours' co-stars Jason Donovan and Kylie Minogue became chart hits, Pearce didn't want to jump on the bandwagon with his broodier material. Success rating: Four stars - It's an ambitious and atmospheric debut. 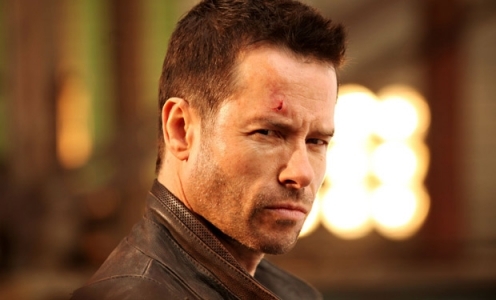 So far so good for Guy Pearce; let's hope the 'LA Confidential' star doesn't keep any more of his music under wraps. Look through our other great galleries! I'm A Celebrity 2014: Who's in the jungle? Why not test yourself with our quizzes? How much do you know about Pancake Day? Which Ab Fab character are you? What should your New Year's resolution be? Are you the Christmas staff party buffoon? How well do you know Bob Dylan? Gunpowder, treason and plot: The big bonfire night quiz! Looking for something different? Try our weird news! Upon reading the evening news, it would appear that almost everyone agrees at this point that global warming or climate change is happening. 22,000 people agreed to clean toilets for WiFi because they did not read the terms. Keep your pets healthy and safe using new and innovative gadgets. A smart toilet called BrilliantPad has been designed for pups and small dogs. Tools designed to ensure computer code in smart cars does not crash has been inspired by hungry penguins. The rounded sleeping capsules send guests drifting into ocean before arriving on desert island by morning. Does Horse Riding Make You Smarter? Sitting on the saddle activates the part of the brain responsible for learning, a study has claimed. A rare cross between a goat and a sheep was born in Turkey. Would You Donate Your Brain? Scientists are appealing for more people to donate their brains for research after they die. Is Man Really From Mars? Life on Earth may have arrived from Mars on an asteroid, scientists have claimed. Lunar mission scheduled at the end of 2017 could find out if beer can be brewed on the moon. A bottle used to teach children how far litter can travel ended up on Scottish beach after 8,700-mile journey. Why Should You Choose WeatherBug Weather App For Weather Forecast? What Are The Consequences of the Bank Of Canada’s Recent Interest Rate Hike? Should We Have More Than One Virtual Assistant? Behavioural Biometrics New Security Technique?